Homepage photo: An angler at Sunrise Landing enjoys world-class fishing. It is the common experience that when strangers who have visited the Rhine, the Hudson, and other famous rivers of the world , take their first trip up the St. Croix river, that they immediately make extremely favorable comparisons between the St. Croix and other famous rivers they have seen. Continue the tradition of discovering the wild and scenic beauty of America's finest rivers at the Saint Croix National Scenic Riverway! Among the first protected wild and scenic rivers, the Saint Croix National Scenic Riverway reminds us of the importance of rivers in our lives. Celebrated for its scenic views, from narrow stretches with rocky ripples to quiet sunsets reflecting off sandstone cliffs, the riverway is remarkable for its natural features and cultural heritage. It's a haven for wildlife — dragonflies, bald eagles, turtles, sturgeon, river otters, freshwater mussels (North America's most threatened group of animals), and many other species. The riverway also tells the rich stories of the fur trade and logging, of the development of tourism in northern Wisconsin, and the shift toward river protection that has led to clean water and beautiful views. The highlight of any trip to the riverway is getting on the water. 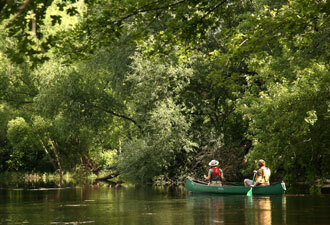 The park includes 156 miles of the Saint Croix and the entire 99 miles of its tributary, the Namekagon. It forms part of the border between Minnesota and Wisconsin and is close to the Twin Cities. Hundreds of miles of river to enjoy can be both exciting and daunting. Don't hesitate to talk with a park ranger while planning your trip. Call or stop by one of the park's visitor centers — the Saint Croix River Visitor Center in Saint Croix Falls, Wisconsin, is open year-round while the Namekagon River Visitor Center in Trego, Wisconsin, is open seasonally. Be sure to check out maps and paddling guides and current river levels. Depending where your visit begins, you have an array of options that include canoeing, kayaking, tubing, boating, guided fishing trips, or tours on paddlewheelers. Contact a licensed outfitter for information about their services. Once you're out there, take time for camping, fishing, and wildlife watching. 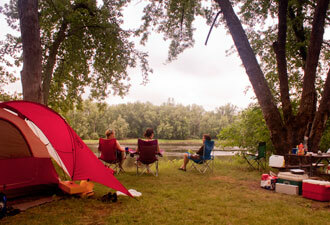 The riverway is known for its primitive shoreline campsites — over 150 to choose from — first-come, first-served, and free of charge! Anglers cast their lines in world-class waters to catch prized smallmouth bass, brown trout, brook trout, and musky — to name just a few. Perhaps you'll see a bear at water's edge or spend your time counting the colorful dragonflies that zip past your canoe. If your plans don't call for an experience on the water, you can explore the riverway by land. 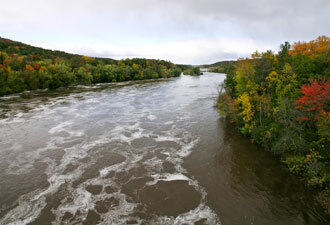 The visitor centers feature exhibits and the 18-minute film, The St. Croix: A Northwoods Journey. Hiking trails and picnic areas are especially pleasant in the spring wildflower season and during fall’s brilliant colors (fewer bugs, too!). In winter, try snowshoeing, cross country skiing, or ice fishing. Of course, wildlife watching and scenic views are available year-round. Plan your visit today and discover the clean water, lush landscapes, and outdoor fun of the Saint Croix National Scenic Riverway.